Apple Tree - Malus spp. A favourite of my childhood. Apples are one of the easiest trees to grow in the Lower Mainland and can provide a bountiful harvest if properly maintained. Unlike many fruit trees that only produce for 15-20 years, apple trees can continue to produce crops for over a hundred years. Apple trees cannot pollinate themselves and require a second variety to cross pollinate with and produce fruit. Because of the popularity of apple trees people in urban settings often don't require a second tree as pollination can occur from neighbours' trees. Apples trees require full sun for best yields and love well draining soil rich in organic material. Do not plant in frost pockets or low spots that have standing water during winter months. Water regularly and deeply during the hot summer months to prevent stress that can lead to disease and insect infestation. Regular watering will also help produce a larger harvest and larger fruit. Fertilize generously in the early spring with compost and compost tea. The roots zone of the tree extends out to the tips of the branches – it is always best to water and fertilize the entire root zone area. 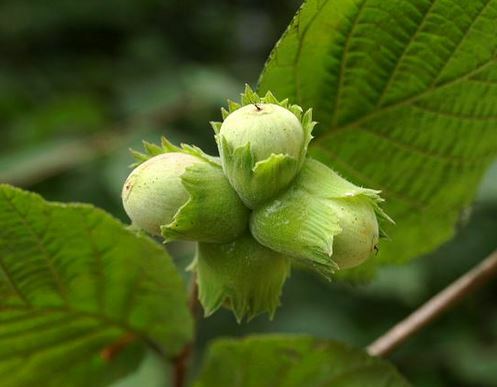 Beaked Hazelnut - Corylus sp. Hazelnuts are a great treat from the garden but you’ll be hard pressed to get any before the squirrels. Commonly grown as either a shrub or small tree, its yellow catkins in spring are followed by small nuts. Grows best in well draining soil with plenty of organic material but will tolerate a variety of conditions. Attracts birds and plenty of squirrels. Cover with netting if you intend to harvest the nuts. Blueberries have gained a lot of attention in the last decade because of their health benefits but they have long been a favourite of many simply because of their plump sweet flavour. On top of all that, they are one of the most ornamental plants you can add to your garden. The lush new foliage in the spring is followed by delicate white flower clusters that attract bees and other beneficial insects to your garden. In the fall the leaves turns deep red before falling off and over the winter the bare branches add structure and colour to the garden. Blueberry bushes like more acidic soil (PH 5.0) than most fruits. Do not lime. Plant in well-draining, rich organic soil in full sun or partial shade. Keep well watered during hot dry summer months and mulch around the base to help maintain consistent moisture level. Plant at least two different varieties for cross-pollination. Brambles are easy to grow and provide one of the largest harvests per square foot of any fruit I've grown. Best of all they grow well along fences and trellises in otherwise potentially wasted space. Plump fruit can be picked daily over a 6-8 week harvest period and added to cereal, fruit salad or baking. Berries are easily preserved by simply putting on a cookie sheet and freezing, then transferring to a ziplock bag. Plants do best in full sun but will tolerate some shade. Soil should be well draining and rich in organic material. Plants are best contained in large containers like half oak barrels or in their own garden bed because of their spreading nature. Cut back previous year's growth to the ground each fall and leave new year's growth for fruiting next summer. Blackberry – Not the thorny aggressive Himalayan blackberries that invade field and roadsides. This thornless variety is easy to maintain and won't take over your garden. Great taste and heavy production. Boysenberry - Tasty thornless bramble. A cross between red raspberry, blackberry and loganberry. Fruit look like large plump blackberries. Loganberry - A great thornless variety. A cross between red raspberry and blackberry. Grows well in the garden and does not spread aggressively like its parents. Large elongated fruit – looks like a stretched raspberry. Tayberry – Thorny semi-aggressive bramble, definitely best to grow in a container to contain spread – trellis for easy maintenance and harvest. Tasty large fruit is delicious eaten fresh or used in pies and baking. Not common because of its thorns but its taste makes it well worth the effort. Fabulous in Tayberry / Peach pie. Once popular for its uses in jams, jellies and pies , gooseberries are a unique addition to the home garden. Large plump tart fruits form in mid summer. These bushes have large sharp thorns and are great in the landscape for keeping people out of and away from areas you don't want them. Plants do well in both full sun and partial shade. Plant in rich organic soil and keep moist. A hard pruning in the early spring or late fall is required to keep plants manageable and fruit accessible for picking. Grapes are a great addition to an urban garden. Not only do they produce delicious fruit – they can grow on trellis and pergolas to create secluded and shady spots. Deciduous woody vine. Numerous varieties and fruit colours available – some great for fresh eating, others for making wine and juice. Grapes grow best in full sun planted in well draining lightly sandy soil with plenty of well composted organic content. Yes, you can grow t figs well in the Lower Mainland with a little care. Figs are not as fussy about soil as many other fruit bearing trees. Welldraining soil is important but it doesn't have to be really rich in organic content. In fact, if the soil is too rich it will grow rapidly at the expense of its tasty fruit. Eat fresh or dried. Great for container growing. Does not require constant moisture but do not let it dry out during fruit formation. Very ornamental in the garden – unique large leaves were briefly popular for keeping modesty in the Garden of Eden. Jostaberry is a cross between black currants and gooseberries - possessing the best characteristics of both. Fruit is larger than a black currant but not as big as a gooseberry. The bush looks like a currant and is thornless, making fruit harvest easier. Flavour-wise it is very much a mix of the two. Great in jams and jellies. Grows as large shrub but can tolerate aggressive pruning. Plant in rich well-draining soil in full sun or partial shade. Rust and mildew resistant. This easy to grow herbaceous perennial is a garden classic. Often considered a vegetable, it is grown for its tart stalks, which are used in pies, baking, jams, jellies, and chutneys. Often mixed and combined with strawberries. Grows best planted in full sun in well-drained rich organic soil – it will tolerate partial shade. Mulch to keep soil moist during fruit production. Tasty perennial fruit. Great low-growing ground cover. Eat them fresh or add to baking. Easy to preserve by simply freezing. Grow in full sun or partial shade in rich well-drained soil with plenty of organic material. Two main types – June-bearing (one heavy crop around June) and Everbearing (produces lighter crop but produces throughout the season). Berries do not ripen once picked so wait until fruit is fully mature (plump and red) before picking. Replace plants every three years or propagate new plants from runners as older plants do not produce as bountifully. Strawberries are great in hanging baskets and have the added benefit of reducing insect damage and making the fruit easier to harvest.